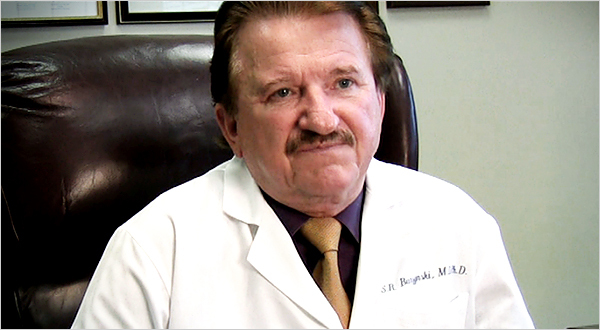 The Burzynski Clinic, operated by Stanislaw Rajmund Burzynski, has offered clinical trials for alternative cancer treatment using antineoplastons. “Antineoplaston” is Burzynski’s name for “a group of peptides, derivatives, and mixtures” that he uses in the trials. The compounds are not licensed as drugs and Burzynski is not licensed to treat cancer with his mixture. He claims to have a lot of anecdotal evidence for his treatment, though looking more closely at what he’s actually doing reveals a lot of curious details, for instance that conventional cancer treatments are used as well in his treatments, and that the success part of his success stories is nevertheless not always unambiguously ascribed to those conventionaltreatments. The treatments at the Clinic are enormously overpriced, and given the time period in which the antineoplaston treatment has remained on the “clinical trial”-stage without breaking peer review (more on his “studies” and publications here), the cost of the treatment regimes, and the way Burzynski actually treats his patients, some have raised questions whether Burzynski himself actually believes in the efficacy of antineoplastons. If he does not, then “crackpot” would obviously not be the most apposite description. You can find a nice and concise explanation of why Burzynski’s practices are questionable here, and a discussion of some of the anecdotes he uses to back up his claims here. He does, however, have a “documentary” that promotes his treatments and paints him as a brave, pioneering maverick, which he – despite the assertions of his followers – emphatically isn’t, and a pinnacle of honesty and actual care in a world where ordinary doctors are prevented by greed from seeing the light (discussed here). Burzynski is, admittedly, rather skilled at providing dubiously honest framings of his work, and has at least made him popular with an endorsed by the usualy stock of prominent suckers for anything that smells of conspiracy, such as Mike Adams and Joe Mercola (Mercola’s endorsement is discussed here). A follow-up to the “documentary” was announced in January 2013, and described as being about as honest, investigative and reality-based as the first. Film-maker and Burzynski champion Eric Merola decided to call it “Burzynski: Cancer Is Serious Business, Chapter 2: A Modern Story,” and you can see a discussion of some of the details surrounding the production here (some reports from an early screening are discussed here and here). Merola himself seems to be currently keeping himself busy as some sort of Burzynski watchdog, arguing that criticism of Burzynski’s practices amounts to hating and baselessly accusing critics of being corrupt pharma shills - standard fare from the denialist movement, in other words. Some have questioned Merola’s intellectual honesty, and his response to critics is not the only reason. Here is Merola’s secret weapon against the skeptics unveiled. Another propaganda video posted by Burzynski’s new PR man, Wayne Dolcefino, featuring Josh Duhamel, is discussed here. In November 2011 the clinic quickly rose to fame after one Marc Stephens, associated with the clinic, threatened several skeptical bloggers and organizations with rather hilariously unfounded lawsuits (one example here). The Clinic eventually had to disavow Stephens and his antics, but reading the press release from Burzynski’s PR flak Renee Trimble, one realizes that they do not explicitly disavow his methods for responding to critics. The sudden public interest in the clinic was bound to cause something resembling a Streisand effect, however, and the clinic did at some point face some further scrutiny. Unfortunately, despite repeated warnings from the FDA, Burzynski and his clinic are still going relatively strong, and he got off the Texas Medical Board investigations on a technicality. A particularly worrisome aspect of the Burzynski affair is the media’s credulous take on his practices; after all, there are plenty of people who wouldn’t let reality get in the way of a nice narrative about a maverick hero facing the establishment all by himself. More here. One of the stories that led up to Burzynski’s quick rise to fame in November 2011 is found here; discussion here. There’s another tragic story here. Quackwatch has been following Burzynski for years, and fortunately there are other powers of good that have taken notice and are trying to make the world a better place. Burzynski is at least the proud recipient of this year’s Pigasus Award in the Scientist Category for his efforts. Diagnosis: A little hard to pin down; a diagnosis would depend on what exactly Burzynski thinks he is doing, which is currently a little murky. That there is just cause for concern regarding his practices, however, is uncontroversial. Update: This is a really good resource as well. A small group of critics have been building a picture of what goes on at the Burzynski Clinic at theotherburzynskipatientgroup.wordpress.com. What one sees in these patient stories is chilling. Wow, I would think he would have ranked higher up on the loon scale as he actually kills people AND bankrupts them first. He does rank high. The ordering is alphabetical (though made complicated by the fact that we are currently on round 2 - when doing round 1 alphabetically Burzynski hadn't yet risen to fame). Dr Fredda Branyon have been saying good things about this doctor as well. We are very happy that you have shared something about him. Thanks a lot. Very interesting comment. You clearly read the post closely, and the marketing ploys of Dr. Branyon paint a clear picture of her as a trustworthy source of medical advice. It is also intriguing that your favorite author seems to be L. Ron Hubbard - no wonder you enjoy this blog. Exactly! Ms. Burns is not the brightest bulb in the hall!!! However, she has decided to utilize blogs like yours and mine (She made an inane comment on my May 8, 2013 post. )to promote her quack who plead guilty to selling illegally manufactured "stem cells" and was facing 3 years in jail and a $10,000 fine. I have been tracking her "victims" and they are people who are dealing with extreme difficulties and loss due to cancer. I am less than happy with her antics and am working actively to create her demise!!! I wish you well. Since Respectful Insolence and others are covering the developments surrounding Burzynski pretty well, we'll generally leave updates to them. Still, it is worth pointing out the (relatively) recent FDA report on its investigations of the Burzynski institute. It is certainly also worth linking to the very good coverage of Burzynski in USAToday. Of course, Burzynski and Merola have responded, and as feebly as you could imagine. To the detriment of civilization, Burzynski seems to have won some significant victories recently; no, he has not provided new evidence for the efficacy of his treatment, but that goes without saying.